Travelling East along the geometria and supposed ley line of East 72nd Street in Manhattan. I was struck by the appearance of an obvious square on the glass door of a Catholic church, instantly reminding me of the time I was confronted with St Paul’s Gothic looking stained glass eye with emanating rays inside of a triangle form. 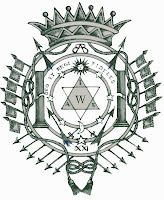 Now here in just above the square and shield there was also a crown with a slanted cross identical to that used by the Masonic Knights Templar Order. 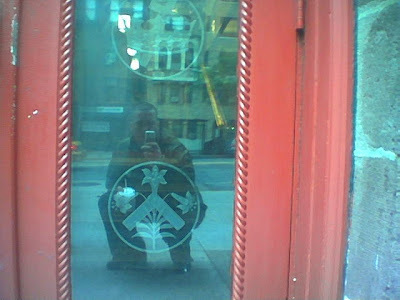 A fellow accompanying me further noted the set of crossed keys and that the name of the church was St. John’s…a well known patron saint of hermetic duality (i.e.-The Baptist and the Evangelist) and then we have this prominent fleur de ley dominating the window etching.